Wikipedia has a tendency for cliques to form and in the case of Wikipedia’s Anthropogenic Global Warming disciples (i.e. the AGW true believers) a huge proportion are easily identifiable as friends on facebook. What’s the big deal you say? Well, on Wikipedia you aren’t supposed to go around asking your friends to vote with you in order to determine Wikipedia content and policy. However, with the AGW disciples this seems to happen quite often, sometimes subtle, other times it is blazingly obvious. One example would be when Tim Lambert showed up out of the blue, after a month-long plus hiatus, at the esoteric reliable sources noticeboard in order to mock the people saying his blog was an unreliable source. In fact, this group of facebook friends, larger than I’ve mentioned, has even gone so far as to use their authority as administrators to defend their ilk. 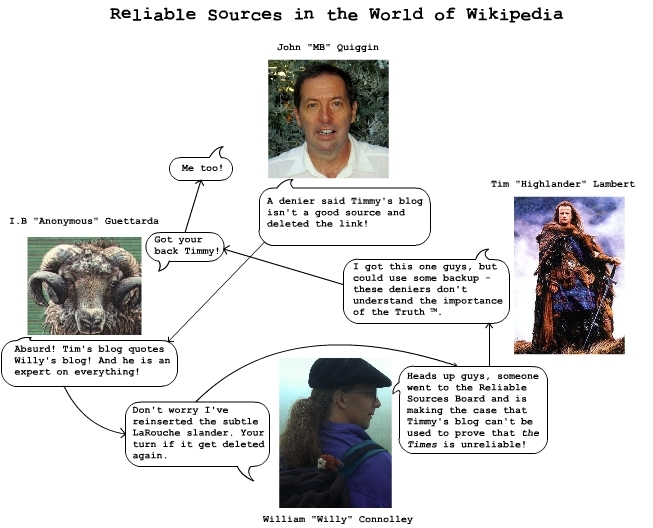 And so, I present to you a funny flow chart I made up of recent events, which demonstrates not only the mentality and subculture of Wikipedia’s AGW alarmists, but it is also eerily similar to the tactics used by alarmist/activist climate “scientists”, as demonstrated by the Climategate disclosures. Well, at least they aren’t trying to make this guy look like a believer in Martians – which is what they’ve done to other AGW skeptics on Wikipedia. Note: The original posting included “Guettarda’s” real name, which I didn’t consider a problem since it is blazing obvious, easily found, and highlights his professional conflict of interest (nothing special with this group) in this area. However, one of their group complained about being “outed,” and even though it isn’t against any policy, GoRight thinks we should respect their wishes and remove that information, and while I think this is typical of their power-tripping mentality and desire to control information I’ll respect GoRight’s feelings on this matter. « A good summary of the climate change problem on Wikipedia. I note that William Conolley still has the same silly picture on his wikipedia page, instead of a proper one. Isn’t that sort of photo considered as Point of View picture, that is, it is not neutral and thus not allowed under the Wiki rules? I wonder how he gets away with that while being a Wikipedia administrator at the same time. When I posed the question to Connolley on his blog a few months back, he just shrugged and said his teddy bear is cute or something queer like that. I guess there are a couple of points to be made here, and I offer this merely as explanation for interested parties: (1) Connolley doesn’t actually control the content on his BLP, per se, although he is certainly in regular contact with a number of people who DO regularly watch over that page so I don’t know if he actually selected that picture, or not, (2) I don’t think that there is anything against Wikipedia policy with respect to that picture in that it isn’t particularly disparaging of the subject, although YMMV as to its desirability and appropriateness, so as long as Connolley doesn’t object I doubt anyone else will either. The photo seems to meet the applicable content guidelines for such photographs as far as I understand them, but I am not an expert in that area of policy. And (3), Connolley is no longer an administrator on Wikipedia. He was stripped of his privileges by the Arbitration committee when he abused those privileges as part of an Arbitration proceeding. I’m also not sure if such a picture violates policy (and don’t really care). The fact though is that he doesn’t even meet the notability standards and that it is simply a vanity page – similar to Elonka Dunin’s vanity page (and her vanity family tree project). I do find it curious that his education isn’t supported by any of the sources listed in the article though (would be interesting if we had another http://en.wikipedia.org/wiki/Essjay_controversy ). Anyway, I imagine his wikipedia page will get deleted – just like Sam Blacketer/David Boothroyd ( http://en.wikipedia.org/w/index.php?title=David_Boothroyd&action=edit&redlink=1 ) after he was exposed as a slimebag (making a comeback though). It’s also interesting that Jehochman, the rather unstable admin who whitewashed Blacketer’s history, now seems to have taken on the mantle of using his administrator authority to bash skeptics and defend Connolley’s ilk as often (and irrationally) as he can. Gah! Nerd politics is so complicated!